This book brings together public services policy and public services management in a novel way that is likely to resonate with academics, policy makers and practitioners engaged in the organization of public services delivery as it is from a perspective that challenges many received ideas in this field. Starting from the perspective of critical management studies, the contributors to this volume embed a critical perspective on policy orthodoxy around critical public services policy and management studies (CPPMS). In so doing the authors bring together previous disparate fields of public services policy and public services management, but more importantly, debate and present what ‘critical’ constitutes when applied to public services policy and management. 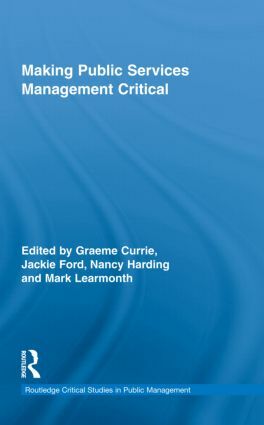 This edited collection presents chapters from a broad range of public services domains including health, education, prisons, local and central government and deals with a range of contemporary issues facing public services managers are examined, including regulation of professions, risk management, user involvement, marketing and leadership. Introduction: Making Public Services Management Critical. Graeme Currie & Mark Learmonth. Section I: Rethinking the Background. 1. From Collective Struggle to Customer Service: The Story of How Self Help and Mutual Aid Led to the Welfare State and Became Co-Opted in Market Managerialism. Patrick Reedy. 2. Toward Unprincipled Public Service: Critical Ideology, the Fetish of Capitalism, and Some Thoughts on the Future of Governance. Frank E. Scott. 3. Sheep in Wolf’s Clothing: Schools, Managerialism, and Altering Ideologies. Patricia A.L. Ehrensal. 4. Public Sector Management? But We’re Academics, We Don’t Do That Sort of Thing!. Michael Humphreys and Mark Learmonth. Section II: Critique of Mainstream Orthodoxy. 5. The Inevitability of Professions?. Robert Dingwall. 6. Critical Risk Management: Moral Entrepreneurship in the Management of Patient Safety. Justin Waring. 7. Public Participation in State Governance from a Social-Theoretical Perspective. Graham P. Martin. 8. Marketing the Unmarketable: The Vlaams Belang, a 'Party Unlike Any Other'. Mona Moufahim, Michael Humphreys and Darryn Mittusis. 9. A Critical Realist Analysis of Institutional Change in the Field of Us Nursing Homes. Martin Kitchener & Bernard Leca. Section III: Radical Alternatives. 10. Critical Leadership Theorising and Local Government Practice. Jackie Ford. 11. Individual Patient Choice in the English National Health Service: The Case for Social Fantasy Seen from Psychoanalytic Perspective. Marianna Fotaki. 12. From Metaphor to Reality: A Critical View of Prisons. Finola Farrant. 13. Queer(y)ing Voluntary Sector Services: An Example from Health Promotion. Nancy Harding and Hugh Lee. 14. The Contribution of Existential Thinking to Public Services Management. John Lawler. 15. Adding Value to Critical Public Services Management. Craig Prichard. Conclusion: What is to be done? On the Merits of Micro-Revolutions. Jackie Ford and Nancy Harding. About the Contributors. Notes. Index. Graeme Currie is Professor of Public Services Management at Nottingham University Business School. He is also Director of one of the NIHR funded Collaborations for Leadership in Applied Health Research & Care (CLAHRC). His main areas of research critically focus upon policy-promoted panaceas for organisational ills of leadership, knowledge management and reconfiguration of professional roles and relationships. Jackie Ford is Professor of Leadership and Organization Studies at Bradford University School of Management. Current research explores leadership as a discursive and performative phenomenon, examining contemporary discourses of leadership and their complex inter-relations with gender and identity for managers.She is committed to identifying the human effects of managerial and organizational changes approached from feminist, poststructural and psychoanalytic theoretical perspectives. She has co-authored Leadership as Identity: Constructions and Deconstructions and has published in a range of journals including Journal of Management Studies, Leadership, Management Learning, Organization, Sociology. Nancy Harding works at Bradford School of Management teaching organisation studies and directing the School’s DBA programme. She has published books on The Social Construction of Dementia (1997); The Social Construction of Management (2003, Routledge) and, with Jackie Ford and Mark Learmonth, Leadership as Identity (2008). She is currently working on a book to be called On Being at Work, which will be published by Routledge in 2010. Her papers have appeared in journals including Organization Studies, Organization, Journal of Management Studies, Sociology, etc. She is editor of Journal of Health Organization and Management. Mark Learmonth teaches qualitative research methods and public sector management at Nottingham University Business School. He worked in the UK NHS for almost 17 years and still writes mainly about this sector - though with increasingly regular forays elsewhere.